Home » Health » What Is Macular Degeneration? Macular Degeneration or Age Related Macular Degeneration or AMD / ARMD is a decrease in central vision, which is your ability to look straight ahead. The macula is a small area in the middle of the inner retina of the eye with the most number of stem and cone cells. This area plays an important role for humans to be able to see well in light and dark. Peripheral vision does not have the same number of cells as the macula, resulting in vision that is not focused or not sharp. Macula helps humans to be more independent and alert to things or circumstances around themselves. This condition affects the ability to read, drive, write, or recognize a person's face, but does not affect side or peripheral vision. Furthermore, this condition develops gradually depending on the severity. Macular degeneration is the most common cause of visual impairment in developed countries. In Asia alone, around 6 out of 100 people are found to suffer from macular degeneration. The cause of macular degeneration is not known with certainty, but the symptoms always develop as you get older. There are two main types of macular degeneration (AMD) with different causes, namely wet and dry macular degeneration. Dry AMD is the most common type and is likely to be detected only when the patient is having an eye exam. However, despite causing more severe conditions, wet AMD is more manageable. Dry AMD begins with the appearance of a buildup of residual substances under the retina called drusen. Drusen buildup which will increasingly affect vision. In the later stages, this can cause degeneration and thinning of cells in the outer layer of the retina ( retinal pigment epithelium / RPE ). RPE is cells that nourish and maintain stem and cone cells in the inner layer of the retina. 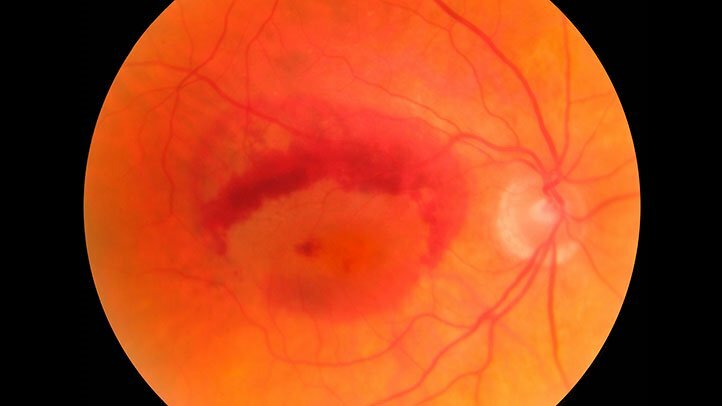 Apart from being caused by a decrease in RPE conditions, this condition is also caused by the growth of fragile new blood vessels from small blood vessels located behind the macular layer. These fragile blood vessels tend to leak easily and draw blood and fluids that can damage stem and cone cells, and cause scarring in the macula. Wet AMD can interfere with central vision in a faster time than dry AMD, ie within weeks to months. Even if bleeding occurs, vision can disappear suddenly in a matter of hours or days. Macular degeneration is a progressive disease whose condition will worsen over time even though sufferers tend not to feel pain. Symptoms of AMD will be more easily known if this disease has attacked both eyes. AMD which attacks one eye is not easily felt because it is still helped by another normal eye. The main symptom of AMD is the deterioration of central vision even though it has been using glasses. Patients also find it difficult to recognize the writing, pictures, faces and facial expressions of others. Difficulty adapting to dim light. There is a blind spot in the field of vision that will expand as the degenerating macular cells increase. Visual hallucinations in people with severe AMD, namely when patients see different images ranging from simple to complex images, generally images of children and animals. Macular degeneration is generally known accidentally when a patient has an eye examination. If the patient experiences symptoms of AMD, the general practitioner will immediately give a referral to an ophthalmologist. The patient's vision will be examined by being asked to see some images that have vertical or horizontal lines. If the patient finds a missing or distorted line, the doctor will continue to do an examination of the back of the eye using a special microscope. The doctor may take photos of the retina to see if there are changes that resemble the condition of dry or wet AMD. Other tests that may be used are ocular coherence tomography and fluorescein angiography if the patient has proven to suffer from wet AMD. Ocular coherence tomography , this test is done using a special beam of light to scan the retina and see the macular disorder in more detail. This test helps determine the type of AMD suffered and monitors ongoing treatment. Fluorescein angiography , this test is done by injecting colored ink into a blood vessel in the hand to find out if there is a blood vessel leak in a patient diagnosed with wet AMD. Leaking blood vessels can be seen from the ink that appears in the macular area, while knowing the severity of leakage and AMD in patients. AMD treatment aims to maximize the quality of the patient's vision, although it is not certain whether this treatment can help prevent or slow the progression of the disease, especially for dry AMD. Dry AMD causes loss of vision in sufferers gradually over a period of 5-10 years even though it does not affect side vision. Here are some types of treatment available for dry and wet AMD. Supplements and vitamins that contain antioxidants, zinc, vitamin E, and vitamin C can be consumed according to the physical condition and health of the patient. Discuss first with your doctor about safe and appropriate doses. How to eat healthy. Consume foods that contain lots of antioxidants, such as spinach, broccoli, and nuts in sufficient quantities. Foods that contain zinc are also good for people with AMD, such as beef, lamb, milk, cheese, yogurt, and whole wheat bread. Other foods that can be consumed are olive oil, salmon, tuna and walnuts. Adjust the treatment of dry AMD with other treatments that are being experienced by sufferers, such as heart disease and high blood pressure. Vision rehabilitation. This rehabilitation helps dry AMD sufferers adapt to their decreased center / center vision. In addition to an ophthalmologist, rehabilitation is done with the help of a vision rehabilitation specialist or other trained personnel who are experienced in this field. Installation of telescopic lenses. This surgical therapy is generally chosen for dry AMD patients whose eyes are infected. Installation of a telescopic lens is expected to increase the ability to see, but only in one eye. This lens can enlarge the patient's viewing area, as well as long and near vision that will be useful when recognizing road signs. For the case of wet AMD, a possible treatment is an anti-vascular endothelial growth factor injection to stop or inhibit vision loss. This drug will block the formation of new blood vessels in the macular area. Laser therapy. This therapy is difficult because it can cause scarring of the macula and loss of vision. Photodynamic therapy. This therapy is done by injecting a special drug into a blood vessel. Furthermore, this drug will bind to the new blood vessels that grow on the macula. After that the laser will be fired at the blood vessel to inhibit the development of wet AMD. Another therapy commonly given to patients with dry or wet AMD who is in the final stage is an intraocular lens system. This therapy uses several layers of mini lenses in sequence to bend the image reflected on the macula to other parts of the retina that are still functioning. These lenses will make the image clearer and bigger in the area and sufferers will need vision rehabilitation to adapt to this situation. Although some cases using this therapy show good results, this therapy also has the possibility of serious complications, including increased pressure in the eye area or even eye damage. Another thing that can be a problem is the high cost of care because the lens must be adapted to each patient's condition. Some of the following tips can be done by people with AMD to adjust themselves and the environment with changes in their vision conditions. Use an electronic reading aid that has a sound system. Change the appearance and settings of the computer, for example by adding a sound system and adjust the screen with greater contrast or change the font size. Use tools that are specifically made for people who have visual impairments, for example a clock that makes a sound. Use public transportation or ask for help from family members to drive or arrange daily transportation for AMD sufferers. Buy books with larger letters or numbers. Perform the following steps to reduce the risk of developing wet or dry AMD. Protecting your eyes from ultraviolet light using solar glasses can help slow the development of this condition. Regular eye tests can detect symptoms of eye disorders earlier so they can be treated early. Start healthy eating habits with a balanced diet and in accordance with the body's condition. Expand foods that contain antioxidants, fish, fruit and vegetables. Get additional nutrition by taking supplements containing vitamins A, C, E, zinc and copper. Supplements in sufficient and appropriate amounts can help reduce the risk of loss of vision. 0 Response to "What Is Macular Degeneration?"